I realize that nobody in the history of the world is allowed to like their landlord. Even if he bakes you cookies and doesn't charge rent and commonly loans you vital organs “just because you seem down,” everyone still hates their landlord. They find the most banal of reasons for hate and then ride it through the entirety of the tenancy. With that said, my last landlord had absolutely no redeeming qualities and was the worst one ever. Tying into my opening paragraph, I realize everyone has their fair share of stories of horror and/or bizarre, so I'll add to yours by making an enumerated list of his idiosyncrasies. 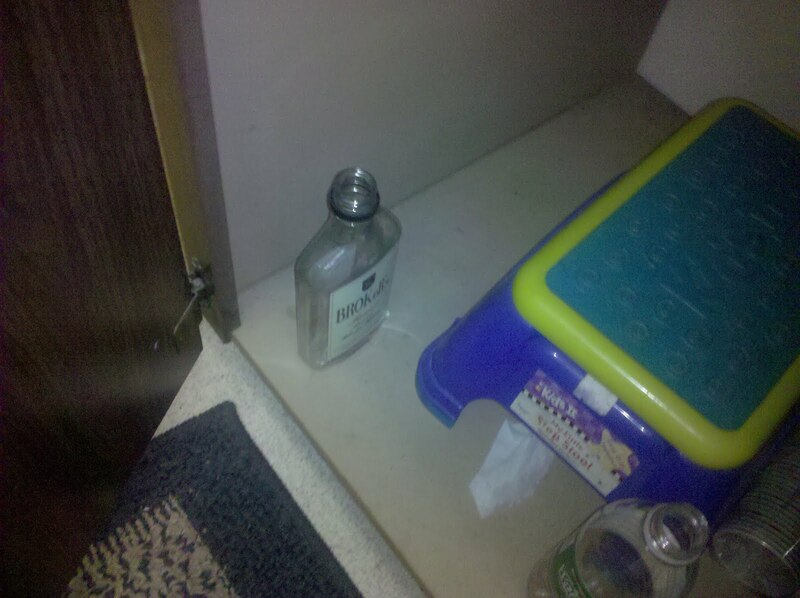 I should have known I was in for problems on the very first day we moved in. We could only unlock the door if we did a shoulder checked it. And then the blinds fell off their track and would not close. I figured, “It's the first day... he'll fix it.” So I tell him about this on the first day and he says he'll be by soon to take a look at it, with the implication being it would happen on the first day. A couple weeks later, when it was no longer the first day of residency, I mention to him that he still hasn't come by. He says it's actually because I needed to fill out some paperwork he never told me about. I fill out the form and return it to him. A month later, I ask if he's planning on taking a look. And he actually shows up this time. We show him the broken blinds, and he responds “That's really high up. I'd need like a ladder or something to get up there.” Luckily, he's a landlord for an apartment building with lofts that have blinds 16 feet high. Of course he should have a ladder—you know, for the times when his crappy blinds break down. He then makes an excuse that he had somewhere to be and bolts from the room. He did not even look at the door. After that incident, he never entered our apartment again. Nothing was ever fixed. It might seem like this would have prevented us from experiencing his ineptitude, but he still managed to accomplish this from outside the apartment. In Seattle it gets really insanely hot for a total of two weeks every summer. Fortunately, that apartment had a pool. But this sign kind of speaks for itself. Also makes it hard to swim in the hot. Even with that slight “oops,” I never needed to shut down the entire enterprise. 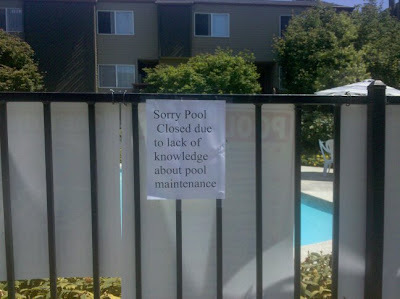 This makes me wonder what the hell went on in the pool to require complete shutdown during hot hot times. I did swim in that pool once and found the experience thoroughly adequate. And another time, my girlfriend had just purchased a used bike. I was riding it around the parking lot to test it out, when my friend, the lord of the land came up to me. He had a furious look on his face and we had the following conversation. “No, this is actually more girlfriend's bike,” I reply, slightly confused. This just angers him more and he goes “No, not that. That!” He then points far away. Far away. Down at the dumpster, which is about 200 yards away (aka “far away”). Someone had placed a vacuum by it. For some reason, it raised his ire. Ire that suddenly gets placed upon the attractive guy riding the girl's bike nowhere near the dumpster. There are a variety of reasons why I'm confused at this point. First, I'm on a bike. Even if I decided to place my vacuum cleaner by the dumpster, the vehicle to take it there would not be one that's hard to ride with an oddly shaped 15 pound hunk of appliance on it. Second, there are several hundred people in the apartment complex. Several hundred people with many dirt cleaning needs living there, yet the one who just happened to be outside that day MUST have dropped it off. And thirdly, have you ever tried to bike with a vacuum? It could be an Olympic sport! These are just selected entries from the canon of Matt, the notoriously bad landlord. Please tune in again soon to hear of his other adventures, from forcing candy on me whilst working out to thinking my girlfriend was pop superstar Rihanna to the whiskey bottle in his office/exercise room bathroom.